You have access to affordable marketing opportunities. Unlike TV ads or magazine spreads, you don’t need a massive budget to run a digital marketing campaign. You can write a guest blog post, engage viewers on Snapchat, or inspire people on Instagram for free. Even if you need to buy into some strategies, the cost of entry is very low. You can run Facebook ads that are highly targeted & convert well for only a few dollars, or you can partner with influencers with reasonable rates. You are closer to your audience. In small business, you have a closer relationship with your customers. You know who they are, what they like, & how they interact; & if you don’t know that information, then you have the ability to ask them! Having fewer customers allows you to establish strong loyalty & personalization, which is something that many people are craving. You have the ability to target your marketing strategies very specifically based on location & other key demographics. You are able to see the data. One of the magical things about digital marketing is the ability to assess how things are going & make changes accordingly. You can see in a glance how a Facebook ad is performing, & if it is not working as well as you’d like, then you can make changes to it right there on the spot. You certainly can’t do that with print ads, & there are many small businesses that have spent money on traditional forms of marketing with awful ROIs. You are able to experiment & pivot. If you are the key decision maker in a small business, you are able to make decisions quickly & effectively. Big brands have a lot more red tape. New ideas need to get approved by tons of people before releasing them to the public because they have the entire world judging their every move. Instead, you have a little more room to experiment & change strategies on the fly, which is a huge advantage in the quickly changing landscape of digital marketing. You can’t afford NOT to try new things. Big brands have millions of dollars on the line. If they take a wrong step, they will not only waste that massive marketing budget, but they could also lose a crazy amount of revenue. You on the other hand risk losing more by not trying new strategies. 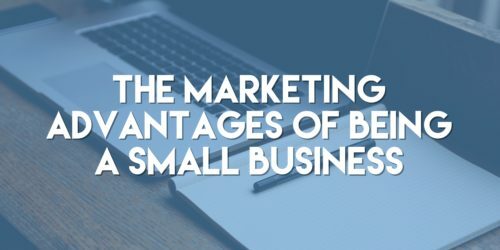 I never understand small business owners’ hesitations when looking at new technology, platforms, & ways of communicating. Why not dive in with both feet & try it. If it doesn’t work, then you know it doesn’t work, & you can move on to the next thing. It is easy to feel discouraged as the “little guy” in a world filled with Nikes & Coca Colas, but keep in mind that you have the advantage of staying true to yourself & to your customer. As long as your marketing reflects that, you will do just fine.